“A brilliant bunch of management candidates, extremely capable- makes selection of candidates a rich and fruitful experience” were the comments from Tata Sky, a first time recruiter on campus, reaffirming the quality of students and the process at IIM Indore. The Indian Institute of Management, Indore (IIM-I) announced completion of its Final placements for the 2016 batch, with 162 recruiters including 53 first time recruiters, extending offers to 617 participants, the largest across all IIMs. 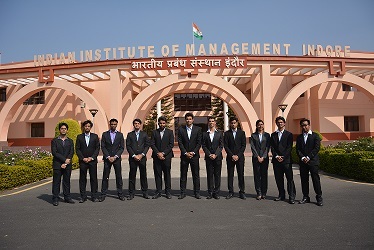 The batch includes 447 PGP Indore, 64 PGP Indore – Mumbai Campus participants along with 106 participants from the first batch of the 5 year Integrated Programme in Management (IPM). With 83 PPOs, this year garnered an overall average CTC of INR 15.67 LPA, an increase of 10% as compared to last year. The highest domestic package was INR 32 LPA while the highest International package stood at INR 30 LPA. The first graduating batch of IPM participants bagged offers from marquee recruiters like Credit Suisse, Deloitte, Nomura, JP Morgan, HDFC, IndusInd Bank, IBM, ICRA Management Consulting, Tata Sky, UAE Exchange among others. The feedback received from the recruiters in the first placement season of IPM has been encouraging. A leading credit rating agency remarked “We found the candidates to have a good understanding of concepts and confidence to face the demand of the corporate world.” With majority of offers being rolled out from Finance domain, the average salary of the batch stood at 11.96 LPA, including International offers such as EA to CFO & MD by a leading international foreign exchange company. The batch diversity at IIM Indore attracted multiple profiles from first time recruiters like Bharti AXA, Credit Suisse, LAVA International, Max Life Insurance, Mondelēz International, Nestle, Tata Sky, Thomson Reuters, UAE Exchange among others. Finance emerged as the leading sector with around 150 offers from marquee recruiters such as American Express, Axis Bank, Bank of America, Edelweiss, Fidelity Investments, Goldman Sachs, HDFC Bank , IndusInd Bank, Kotak Mahindra Bank, Nomura, SBI Bank and UAE Exchange, including 60+ offers rolled out by Credit Suisse, Deutsche Bank, ICICI Bank, JPMorgan, Nomura and RBS put together. Growth in the offers from Consulting Sector was another key trend as The Boston Consulting Group, Deloitte, KPMG and ZS Associates together made 45+ offers, contributing to an overall 100+ offers in the domain. Other recruiters in the domain included Ernst & Young, PwC, Cognizant Business Consulting, IBM, ICRA Management Consulting, WNS Global Services amongst others. The Institute continued its stronghold on the Sales and Marketing domain with a total of around 150 offers being extended to the participants. In FMCG, consumer goods, telecom and media sector around 110 offers from major recruiters such as Akzonobel, Boeghringer Ingelheim, Coffee Day Beverages, General Electric, Godrej & Boyce, GSK Pharma, HCCB, HUL, Idea, ITC, L’Oreal, Marico, Maruti Suzuki, Nestle, PepsiCo, Philips, Pidilite, Tata Sky, Videocon and Vodafone. Aditya Birla Group, Airtel, GE and HUL recruited students for their coveted leadership program. The technology sector witnessed participation from recruiters like Accenture, Capgemini, Cognizant, Dell, Google, Hexaware, HCL, Infosys, Mindtree, Mphasis and Wipro to name a few. In the e-commerce sector, leading players such as Flipkart, IndiaMART, Nykaa, Paytm and People Group(Shaadi.com) extended multiple roles including Product Management, Category Management, Supply Chain Management, Product Marketing and Program Management. Our participants interested in HR domain received offers from Coffee Day Beverages, IBM, Idea and ICICI Bank. Niche roles like EA to CFO, EA to MD, VP- Strategy, City Head – Operations were also offered by some of the first time recruiters.